Julia and RJ married on a sunny, hot day at the Scripps Seaside Forum. I just love how natural and flawless Julia is! The wedding took place during the major heatwave we had this summer, but you’d never know it looking at her in the pictures. Because it was such a bright day, the first look took place indoors. How cute are these two? Julia wanted a classic wedding that balanced romantic and clean elements, and I think we nailed it! Once the First Look and bridal party photos were complete, we began the ceremony….The ceremony was so sweet and heartfelt. 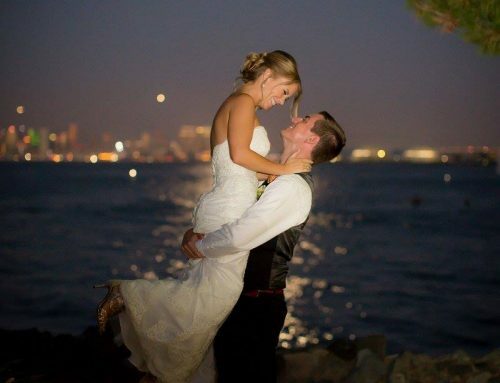 The newlyweds also went down to the pier and got some incredible shots. 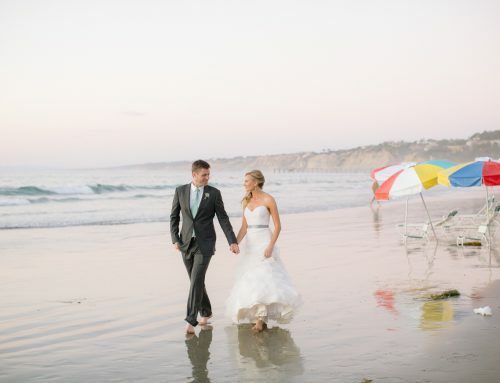 Sigh:) We love our Scripps Seaside Forum weddings! They are always picturesque and beautiful. Then, it was time to relax and enjoy! Julia and her mother Sandy poured a lot of love into the small details. Here are a few of our favorites. Each guest was given a potted succulent. We also wove the couple’s love of wine into the day. Wine barrels were used for the ceremony, as well as wine boxes to display desserts. In lieu of a sweetheart or head table, Julia decided upon several farm tables lining the middle of the room for the newlyweds and the entire bridal party. The table was adorned simply, with a lush garland, tons of candles, bud bases and a small olive branch at each place setting. Julia and RJ, I just adored working with you! Thank you so much for your trust, and giving us the opportunity to be creative with you throughout the entire process!! I wish you all the best in the world.